Four Catholic schools in archdiocese named tops in U.S.
Students and the school community at St. Genevieve School in Flourtown celebrate their award as a 2016 Blue Ribbon School by the U.S. Department of Education. Four Catholic schools in the Archdiocese of Philadelphia were among an elite group of 329 elementary and secondary schools named 2016 National Blue Ribbon Schools by the U.S. Department of Education, it was announced on Sept. 28. They were among the 18 schools, 13 public and five private, so honored in Pennsylvania. The schools are St. Genevieve, Flourtown; St. Mary Interparochial, Philadelphia; St. Philip Neri, Lafayette Hill and Holy Family, Phoenixville. Schools honored include 279 public and charter schools and 50 non-public schools. To put that in perspective, non-public school awards average one per state, and Catholic schools in the Philadelphia area took in four of them. 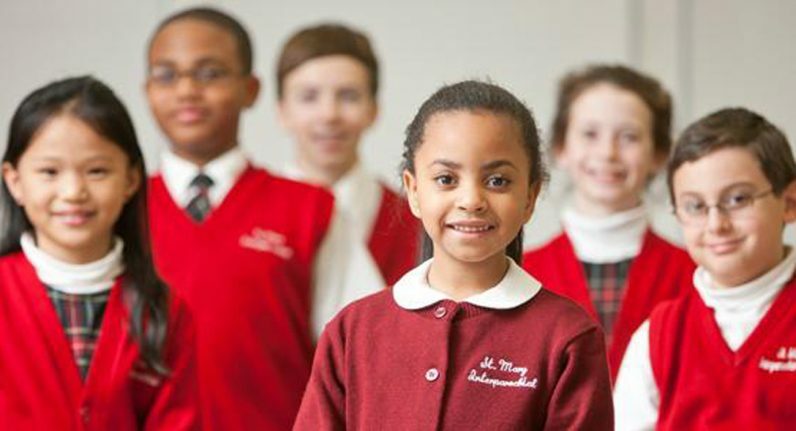 Awards are given in two categories, “Exemplary High Performing Schools” and “Exemplary Achievement Gap Closing Schools.” All four of Philadelphia-area Catholic schools were in the high performing category. St. Mary Interparochial School in the historic area of the city has 255 students, according to Jeanne Meredith, the principal. The school was first founded in 1782 but closed in 1902 and was resurrected in 1968. It operates independent of Old St. Mary Parish and draws a very diverse student body from 41 zip codes, including some from New Jersey. 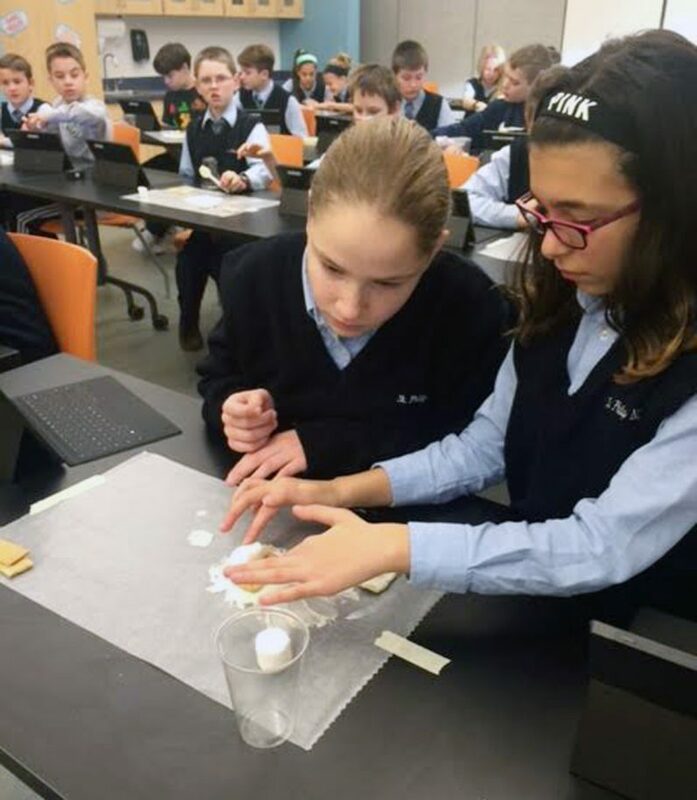 Students of St. Philip Neri School in Lafayette Hill take technology seriously, especially in the science lab. After the announcement the news spread rapidly. “We got many emails and people stopping us in the streets,” the principal said. On Friday all the kids dressed in blue and there was blue water ice in the afternoon, but it will be an all-year celebration. St. Philip Neri is a relatively large parish school with 518 pupils, according to Elizabeth Veneziale, the principal, who also gives credit to the parish pastor, Msgr. Charles Vance. Technology permeates the entire program, including religion, math, science, social studies, physical education, fine arts and world languages. “Our school focuses intently on Gospel values, such as honesty, compassion, forgiveness and mercy, which are relevant to people of all faiths,” she said. The entire Blue Ribbon process started a year ago, but with award, “Everybody is ecstatic,” Veneziale said, and the school has received many Facebook comments. There was a celebration on Friday and celebratory banners and badges have been ordered. Although the official announcement was last Wednesday, the schools knew in advance but couldn’t talk about it. When all of the teachers at Holy Family School showed up wearing blue, the students knew something was up but they couldn’t figure out what. 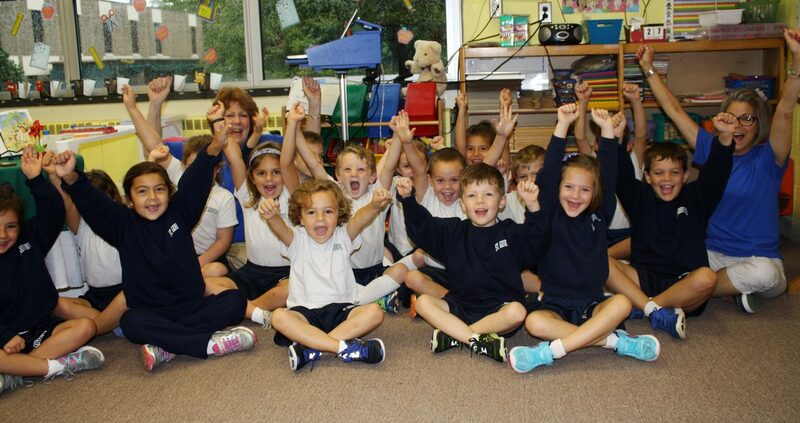 The school atmosphere was “excitement, pride and joy,” said Anne Marie Braca, principal of 350-student Holy Family. Technology-wise all students grade five and above have a school-issued iPad and all classrooms have smartboards. The foreign language program features Rosetta Stone language software on the computers in addition to the classroom teacher. The students gain awareness of the need to help others by brainstorming and executing service projects in each grade level and engage in community outreach by visiting a local senior center, assisting the local food banks and praying for community members. But of course it’s about the student in the end. All of the students painted a hand blue to be transferred to a huge banner. “It symbolizes they all had a hand in the award,” Braca explained. At St. Genevieve the Blue Ribbon Award was a bit of déjà vu; this is the third time the school was so honored. But “none of the students were there for the award before because the years were 2000 and 2006,” said Sister Theresa Maugle, S.S.J., principal at 272-student St. Genevieve. “I would say it is due to the dedication of the faculty, the collaboration of our Home and School Association and the wonderful support from our pastor, Msgr. Michael Matz,” she said. As with the other schools, the reaction to the award was positive and enthusiastic on the part of students, parents and community. All of the award-winning schools will be recognized at an award ceremony in Washington, D.C., Nov. 7-8. 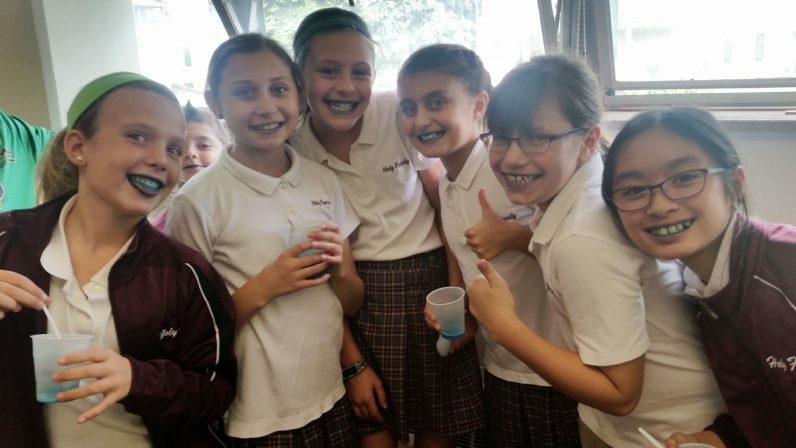 It’s a blue day — complete with blue water ice — and that’s a cause for celebration at Holy Family School in Phoenixville, which was named a Blue Ribbon School this year.